The crafting obsession continues here at the Beach House. I got a taste for it at Christmas time and it seems that it makes me very happy. I am almost done with the little Beach House Brat's girlie room makeover, but she needed some art work to go over the bed. As I don't really have two brass razoos to rub together after Christmas and our regatta trip, which was really a business trip, I couldn't just head off to the shops and pay lots of $$$$$ for something to adorn her walls. So I made something to hang instead. I'm calling this one Love Birds. The birds were $6 for the box set at the Bed Bath and Table sale. The felt was $1.20 per swatch. The string, pegs and frame I had. So just over $10 and I have to say it looks ab fab on her wall. Can you tell my word for 2012 is LOVE? That's cause I am loving life right now. We've have had a run of beautiful weather in Sydney and as you can see from the Twit Pics in my side bar we have been out amongst it, enjoying this fabulous Aussie Summer. But the real reason I love life, is that it's a whole lot better than the alternative. Hey, you guys know mine is far from perfect, but I am grateful for what I've got and am making the most of it where I can. This little ensemble may also inspire some easy Valentine's Day art as well, and if I change my mind about life, I can insert any word I like. Does anyone know a four letter word for 'naughty girl'. The Beach House Brat I mean...not me!!!!! 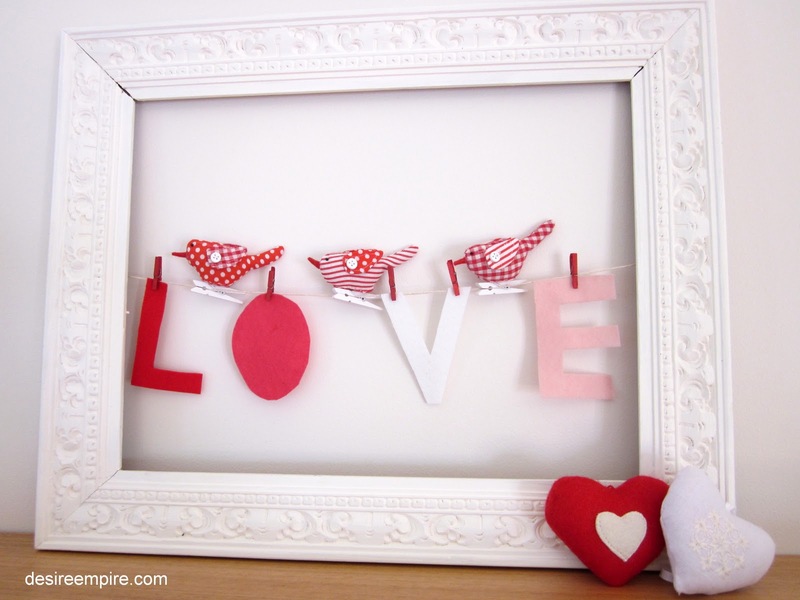 The little love hearts were Ikea Decorations and are not part of the work but added a layer when I was shooting it on my mantel. They were not packed up with the Christmas decos as I want them around all year. I also have a winner for the Seaside Style Interiors Book give away. Linda from Life With Linda, so hopefully she emails me with her details so I can ship the book. Thanks to all the lovely people that entered by following me. Sizzle and Zoom asked about the Norfolk Pine branches I used as the centre piece in my Coastal White Table. They come from Norfolk Island, a small tropical island a few hours flying east of Brisbane. They were widely used in the building of ship masts in the 18th and 19th centuries. The are massive and grow very straight (although not in this shot). 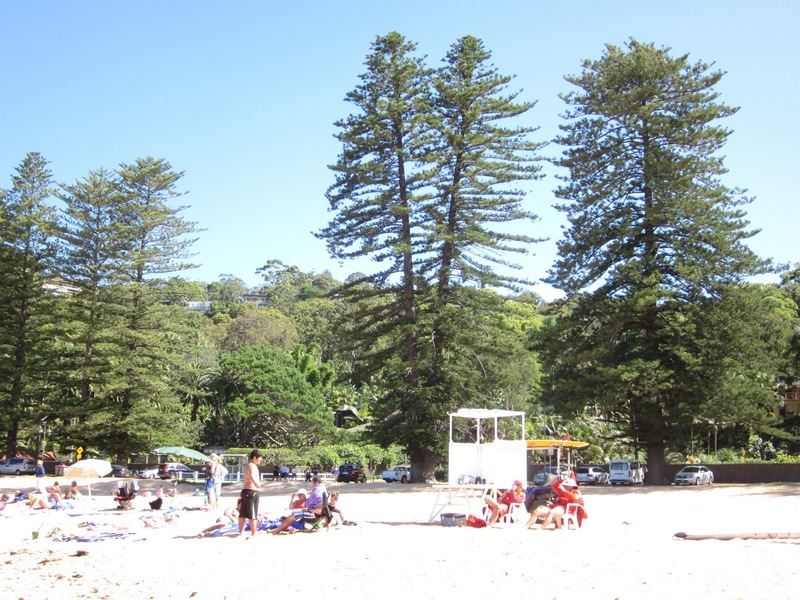 They grace the beach front of many Sydney Beaches and I also happen to have one in my front yard. Here they are at Palm Beach this afternoon. Hope to finish my little babies room over the weekend, don't you think she deserves it? Boy she is at her best here. Plum tuckered by an active beachy lifestyle and getting blonder by the day. Love her to bits. You know I love little Miss Beach House Brat's new artwork. It's adorable and she is as well. Thanks for the info on the Norfolk pines. They are gorgeous. I will be on the lookout for them here. Oh My ovaries are just aching for alittle girl to do something gorgeous for like this. Maybe I might have a go at a little sailboat version. What a very clever Mummy you are, I'm sure she will love it. How adorable is she................what a lucky Mummy you are, too! How different life might have been with one like her around the house! Sigh! What beautiful art! Thank you for coming by my blog yesterday. I am your new follower! That is just the sweetest art work! I love it & think you did an excellent job. The birds are adorable. What about 'PITA ' for a 4 letter word. She won't know what it really means! I don't know what PITA means either. Let me know here but only if it's G rated. How adorable! 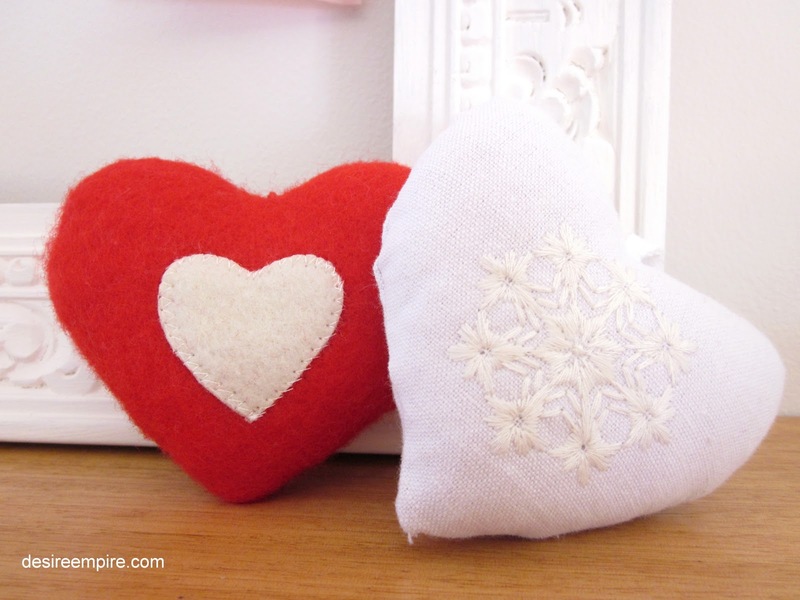 Perfect for Valentine's day or year round. :-) Thanks so much for sharing your creativity and talent with us at Inspiration Friday! a cute and simple idea..bet your daughter loves it! she looks nice and worn out after a day at the beach. Found you via Five Days 5 ways friday free for all. Absolutely love this wall art!! 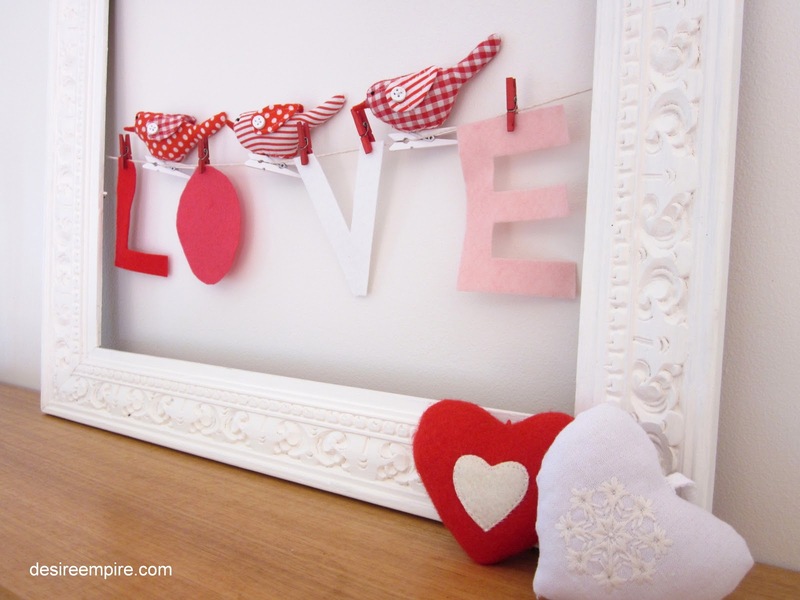 I would love to borrow the idea for my valentine's mantle!! The artwork is totally gorgeous & twice as nice because it was made with love! Just got back from my summer holiday so I'm catching up all the lovely posts I've missed! Happy New Year to you & all the best for 2012! Thanks for following along with Coastal Style - it's been a fun year! Those little birds are to cute. I would love for you to join my weekly fri-monday linky. I will also be hosting a Valentine contest starting on the 16th. Come link up old and new Valentine posts for a chance to win. How adorable. I just love the little birds and how you hung the letters. Genuius. Wow you are creative...Happy weekend and mine is up too. now you may be crying..but now you have me smiling... Now I know what to do with all my frames...so I am going to "try" to play copy cat....heehee..
Lovely tutorial! Love this sleepy face...adorable! Wow, that is so adorable! So is your darling daughter. Happy P I N K Day! This is precious! Such a cute idea.. turned out great! Happy Pink Sat. I "LOVE" it so neat and clean. Perfect for precious girl. 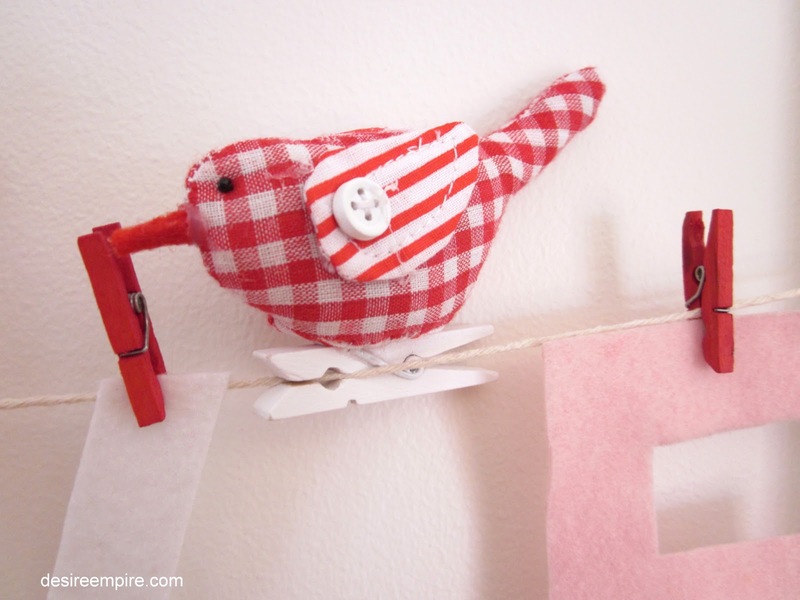 What a supercute idea for what to do with those birdies! And your little girl is a cutie pie! Happy Pink Saturday!! This is an adorable art piece! I appreciate you linking informative post to Potpourri Friday! This is so cute! Love it! Stopped by from I heart naptime's Sundae Scoop! This is so adorable! I would love it if you would share at our sharing party at http://craftymomsshare.blogspot.com/2012/01/sharing-saturday-2.html. Thank you! Cute idea! HPS visit, have a great week! 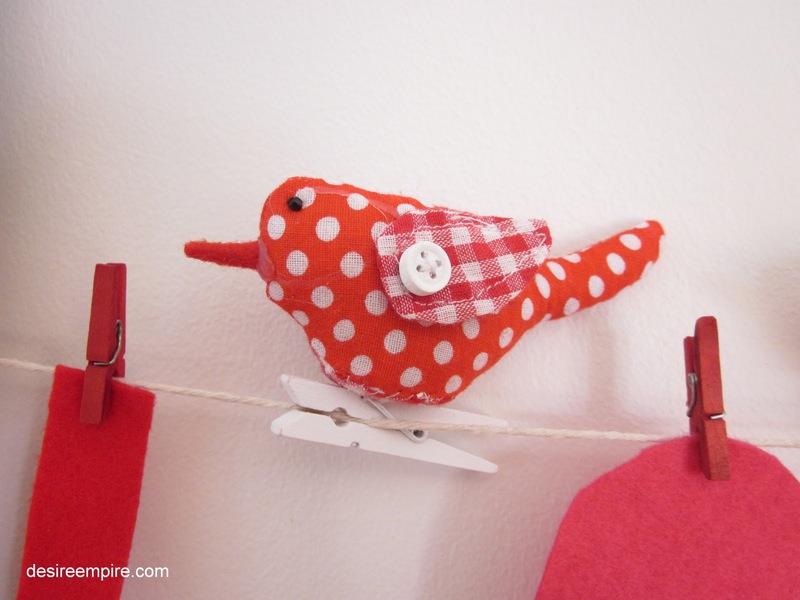 Love the little red gingham bird.. Sweet little girl would be playing in the snow on our beaches. >>. Your daughter is so precious. I love the artwork you made for her room. So creative! 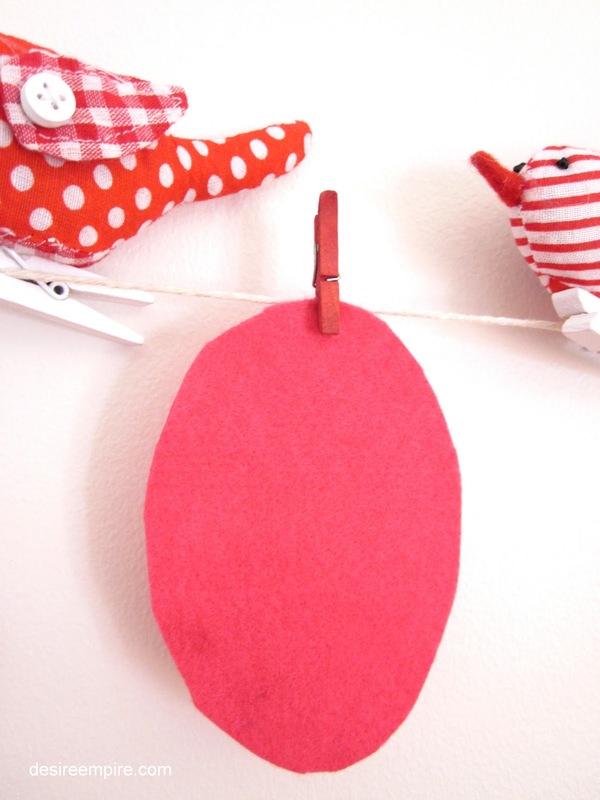 What a cute Valentine craft. 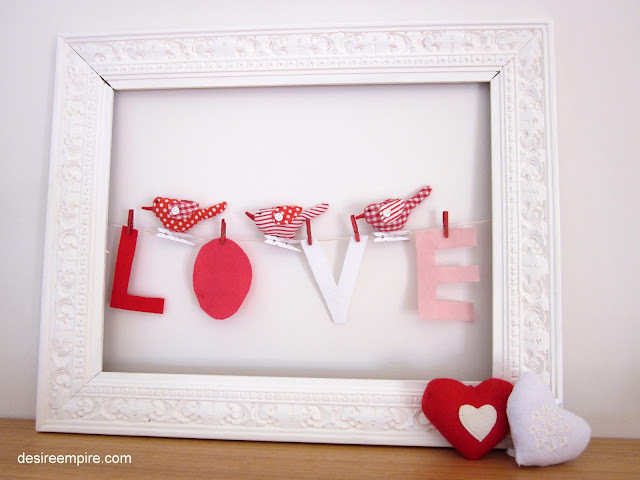 I love the frame you went with and the white birds are so cute!! May have to make something similar to this for our house. it seems that it would be easy to change out for different seasons as well!! Thanks for the inspiration! Thanks so much for linking up to my Valentine Link Party! I LOVE this :) Super, super cute!!! I might just need to copy it ;) Thanks so much for sharing your creativity with us at Sharing Saturday. hope that you have a great week. What a sweet little girl! 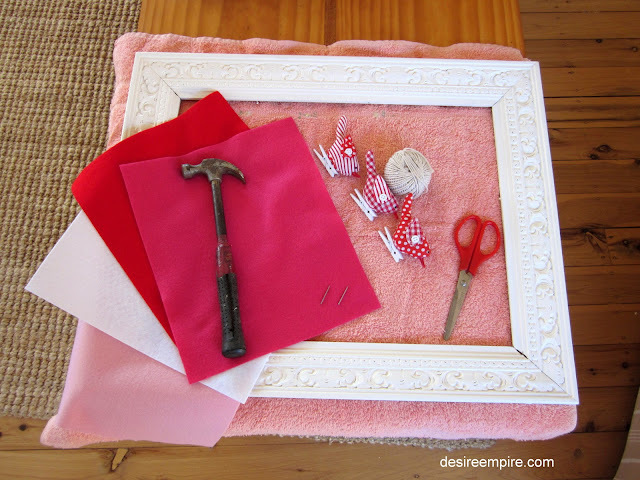 Cute idea for her room! Thank you for joining me at Home Sweet Home! I love everything about your art work...the birds, the mini clothes pins, the frame...fabulous! Thanks for joining us at A Crafty Soiree. I featured your project in this week's newest one. Oh my! I think I'll feature this too! This is adorbs! She certainly IS adorable and so is this project. I had a hard time deciding whether to feature this or your amazing Christmas table. Thanks so much for linking it up to Fabulous Friday. Please do come back next week! Just wanted to let you know that I featured you at http://craftymomsshare.blogspot.com/2012/01/baking-with-hazel-again.html. Thank you again for sharing at Sharing Saturday! I love those little birds you added. :-) Just the right touch! And I'm a sucker for frames. Great job! I love this...it would look so cute in my baby's nursery! I'm your newest follower from the At Home With K party. I'd love you to stop by my blog & maybe follow along too! I'm also hosting my first giveaway for a free My Memories scrapbooking program, If your interested you can enter until Saturday! I love everything about this--esp the buttons on the little birdies! SO true! I hate the word verification! If only every one would heed your words of advice... this is super cute, especially the little birds.